The film wasn't so bad. In fact musically, it was a treat for the fans. The wonderful score by Hans Zimmer continues where Man of Steel left off - the recurring motiffs/themes gives Batman V Superman a strong sense of continuity and coherence. In the sequence that followed, we revisit the destruction of Metropolis (from the earlier film), seen through the eyes of Batman. Here the music helps the narrative to quickly swap between perspectives of these two main characters, guiding the audiences through this frantic segment. Most importantly here, the powerful and awesome drum orchestra theme (from Man of Steel) highlights the scale of destruction and damage General Zod's battle with Superman brought to the city. The music brilliantly quotes the poignant moments - we see the helplessness of Man, the people of Metropolis being caught in this epic battle between two super beings. This would set the tone for Batman's animosity towards Superman, from which the story takes off. Superman's planet Kryton theme came in the scene next, where one of their space ships were showed to have crashed into the ocean. When Superman appeared again we got his man of steel theme. With all the fear and animosity setting in against him, he sought comfort once again in his mother's words, and we hear the wonderfully simple, yet memorable gentle piano theme that recurred in the first Man of Steel. I remembered it partly because it was so distinctively placed in a "corner" on the right side of the mix and that it sounded so fragile, impact. I believe it's a very slightly out of tune upright piano. It's probably my second most favourite theme from the first score, after the drum orchestra theme. Luther's theme was a melodramatic classical period sounding piece, which upon a first listen I found to be over the top. However thinking later about the context of the film, where you have super beings from another galaxy, trashing up an entire city, an evil genius threateningMankind's existence, and throwing in a caped crusader and the (wonderfully gorgeous) Wonder Woman... nothing's too over the top, is it? Oh do check out the first awesome Man of Steel soundcheck. The incredible drum orchestra piece alone is worth the price of the CD itself. If you get the Deluxe Edition, it comes with some great behind-the-scenes photos and interviews. 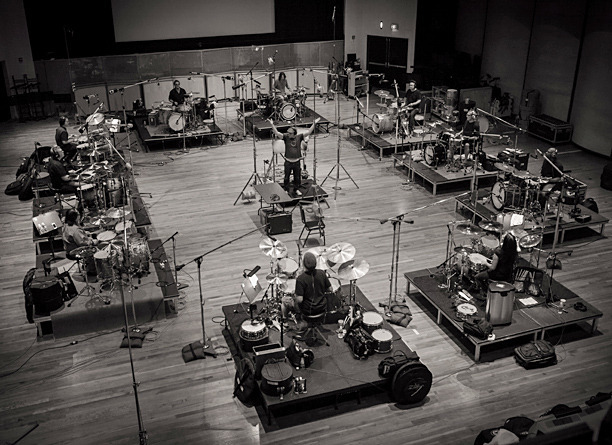 Behind-the-scenes from Man of Steel soundtrack. Recording session for drum orchestra.